It's a sad state of affairs again, now that we have seen another major event in the USA where someone has caused trouble in Boston, and the news is putting speed ahead of clarity or accuracy and this time, safety too. As the Police in Boston and surrounding areas were conducting their duties of trying to round up and apprehend the suspects, the news media was aggregating social media images from the public and posting them online. This put the officers in potential danger. 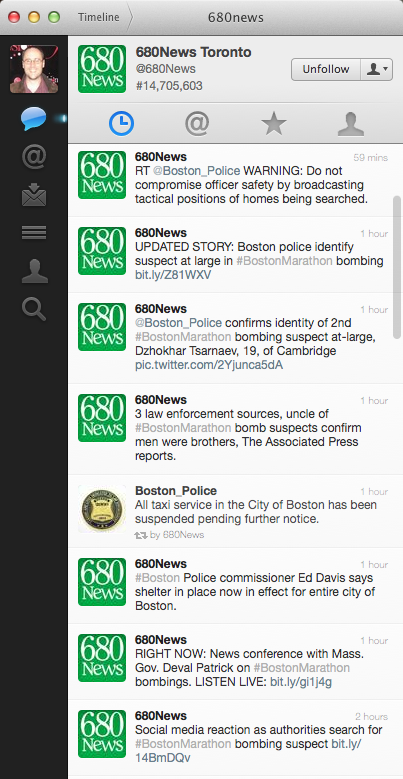 Things got so bad, the news media didn't even have a clue as to what it was posting, as seen in this image, where the bottom tweet is the aggregation of images from around twitter showing officers in peoples gardens with guns, and the top tweet is the same organisation (680 News) retweeting the Boston Police warning to not broadcast the officers positions. When confronted with something like this, you have to wonder what is going on. They could argue on the one hand that broadcasting these aggregated images is "in the public interest", however, arresting the suspects without endangering the officers' safety is more likely "more in the public interest".